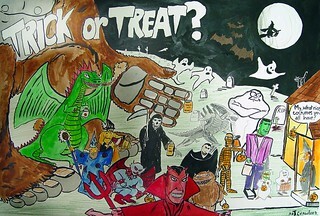 In 1987, the year I graduated High School, I did this poster for Halloween. I’m still proud of this one. It’s a big mishmash of characters, it made an impression on those who came by, it was fun to do. Joe Crawford blogged this at 6:20am in 2005 in August. The 17th was a Wednesday. You are reading this 14 years later. Comment. There are 3 comments Tweet. Send email. It has hashtags→ drawings halloween memories .